Does a good job when you finally get it set up. However, therein lies the problem. The drivers for this card are extremely finicky with windows 8.1 and are a pain in the *** to install. I had to boot into safe mode multiple times to initially install the drivers otherwise my pc would bsod shortly after a normal boot. On a separate note the card restricts airflow to my gpu. PC is literally next to the router and it can barely pull 75mbps down (my internet provides 220mbps down, 20mbps up). Haven't tested it out of my office yet to get other results but my laptop and even CELL PHONE gets quicker speeds from the same location. Failed on me after 2 weeks. Could barely get 1.0MB/s+ download speeds. Decent performance on internet browsing, Youtube and online gaming suxs, but that's only because my PC is pretty far from router... but I give it 5 stars. For when i need to take this somewhere that isn't home. 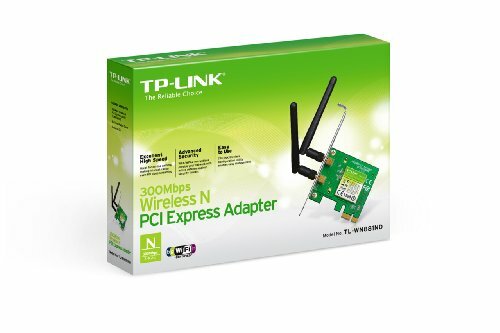 This is a nice budget wifi card for your pc. I'm using it to transmit wifi for my phone. Works well and fast for me, but for my friend, he started getting lag in COD, but with ethernet it went away, even though he was near router and had high-speed internet and everything. So, somewhat unreliable, I guess.